This woman has so much presence, it's hard to ignore. She always appears to be gracious, patient, and thoughtful, and she's really very funny. 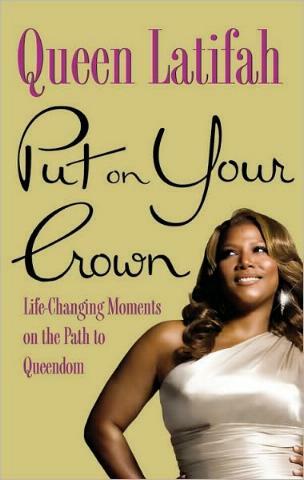 Queen Latifah's (aka Dana Owens) book is like a self-help for young women without being preachy or condescending. Queen Latifah's been there, done that, noticed the lack of self-esteem in young girls and women today, and is doing something to help them (and others who feel the same) be all they can be. She's upbeat, postitive, and encouraging with her words that come from experience. (It's okay to be down now and then, or to feel sad, but the important thing is to remember who you are and that there will be better days, and to pick yourself up and move on—often easier said than done, but unless you own a piece of positive thinking, the climb back up will be so much more difficult.) I love learning from others who've tripped and want to help others not to go on and fall down. Queen Latifah's advice could be boiled down to living in the moment and following your passion, and I loved this sentence: "The thing about following your passion and living in the moment is that you're able to see more openings than most people and have the courage to jump through these doors." That's what I'm doing, and despite being penniless, I'm happy. Fortunately for Queen Latifah, she had the enviable support of a loving and gutsy father and an attentive and thoughtful mother, as well as a "helper" in the form of a friend from her teens. In her book she's trying to be as supportive and encouraging to those who didn't or don't have what she had. Take her advice and make it your own, especially if you don't have it at home. Support can come from the most unlikely sources. One sentence I didn't agree with, and I don't know if it's the Queen's or Suze Orman's: "Wealth is a blessing from God,...". Hard work and diligence creates wealth, just as the lack thereof could create poverty. I don't believe it's God's blessing that I am penniless either; there's more to it than a "simple" explanation. Chapter 3 on Money is very important. It's not only about money, it's also about knowing who you are, as well as learning to give. Dana's mother sounds like a saint and a great human being. Conclusion - A rare three stars for such an intelligent and helpful book. A fanstastic read. I'm so happy there are still people out there with a conscience, morals, and common sense.